These pretty sweet shoppe candy boxes prove practical can also be magical. 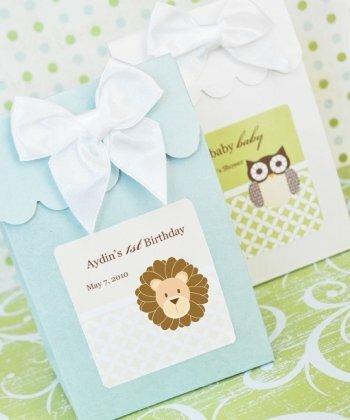 From a sweet little bird to a darling elephant, a full range of animals and soft-hued colors are yours to choose from to create the perfect label for the favor boxes. There's also no better way to keep the personalization going than to fill them with mom-to-be's sweet favorites, whether they prefer macaroons, almond candies, or other exquisite treats. For a really modern idea, make them the gift bag accompaniment to a baby shower candy buffet table of popular candies and sweets! Each shimmery-colored box comes with a satin bow coinciding with the color of the box. Get a few different colors to mix and match bow and box colors for a unique contrasting look. Stickers on the box flaps hold them closed once they're filled. To customize, select from a variety of baby-themed labels to be printed with mom's name and a thank you. Boxes arrive separate from the labels. Some assembly required (attaching the self-stick labels and stick-on satin bows to the boxes). Size: 5.75" x 3.75" x 2.5".